Low blood pressure or hypotension is defined as “any blood pressure that is below the normal expectation for an individual in a given environment”. The diagnosis of low blood pressure is dependent on the symptoms associated from low blood flow; hypotension tends to vary with an individual’s lifestyle, health and age. “Blood pressure (BP) is the pressure (force per unit area) exerted by circulating blood on the walls of blood vessels, and constitutes one of the principal vital signs”. As blood circulates from the heart and through the arteries and capillaries, its pressure decreases; the reduced pressure continues as the blood is also moved toward the heart via the veins. Blood pressure is also created from the force of arteries as they resist the blood flow. Blood pressure is represented by numerical readings, the first is the systolic number which represents the pressure from heart contractions when it’s pumping blood, and the second is the diastolic number which represents the pressure when the heart is at rest. The normal systolic reading is 120 while the diastolic is 80, both represented in millimeters of mercury (mmHg). Blood pressure that reads between 140 or higher systolic, and 90 or higher diastolic, is considered high. 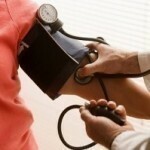 Low blood pressure will result from inadequate blood flow through the arteries. When this happens, vital organs such as the kidneys, heart and brain do not receive sufficient oxygen and nutrients for sustenance and may suffer permanent damage. Unlike high blood pressure, hypotension cannot be determined by a specific pressure number. Generally a significant reduction in blood volume, cardiac output (the amount of blood pumped by the heart), and medications are causes of hypotension. Factors such as dehydration, age, moderate to severe bleeding and inflammation of organs will cause blood pressure to fall. There are also certain medications that are risk factors, these include: diuretics, ACE inhibitors and beta blockers. Postural (orthostatic) hypotension is a “sudden drop in blood pressure when an individual stands up from a sitting, squatting, or supine (lying) position”. Blood settles in the veins of the legs so the heart is unable to circulate enough blood to the rest of the body. This causes the blood pressure to drop. Vasovagal reaction is a condition in which a healthy individual may develop hypotension if they experience extreme levels of emotional stress, physical strain or pain. Heart conditions normally affect the way the heart pumps blood throughout the body. Heart muscles will deteriorate if the heart suffers from heart attack, toxic medications, viruses and valvular diseases. Inflammation of the sac that surrounds the heart will restrict its ability to circulate blood throughout the body. Without enough blood to the body’s organs low blood pressure will arise. Pulmonary embolism is a condition in which a blood clot in a vein breaks off and travels to the heart and eventually the lung. If the blood clot is large enough it can block the blood supply to the heart’s left ventricle and decrease the blood that returns to the heart for circulation.